This month’s blog post is by Charlotte Walker-Said on history of law and religion in West-Central Africa, and touches upon current issues as well. Charlotte is an Assistant Professor in the Department of Africana Studies at John Jay College of Criminal Justice (City University of New York). Apart from researching the transnational character of Christianity, and its influence on gender politics and family law in Africa, she has also published on human rights in Africa. Today’s excellent blog post by Debjani Bhattacharyya is on environmental legal history. Debjani is an Assistant Professor at Drexel University who specializes in Modern South Asian history, urban environmental history, legal history, history of economic thought and subaltern studies. Our first blog post of 2017 is by fellow Hurst Summer Institute alumnus and true blue world legal historian Laurie Wood, Assistant Professor of History at Florida State University. (http://historydev.fsu.acsitefactory.com/person/laurie-wood). Welcome to Toronto to those of you at our annual ASLH meeting! Our blogger today is Iza Hussin, Lecturer in Asian Politics and Mohamed Noah Fellow at Pembroke College, University of Cambridge. Her new book, The Politics of Islamic Law: Local Elites, Colonial Authority and the Making of the Muslim State was published by University of Chicago Press earlier this year. Her profile can be found here. Our second blogger this Fall is Philip Thai, Assistant Professor of modern China in the Department of History at Northeastern University. He can be contacted at p.thai@neu.edu. His post provides a snapshot of coastal smuggling in the People’s Republic of China (PRC) (1949–present). Our first blogger this Fall is Fei-Hsien Wang, Assistant Professor of modern China in the Department of History in Indiana University Bloomington. She can be contacted at feihwang@indiana.edu. Marie Seong-Hak Kim, legal historian at St. Cloud State University, has published an edited volume on Korean legal history. In the recently concluded ‘Roundtable on How to Study Religion in Times of Crises’ on June 28th 2016 organized by the Asia Research Institute at the National University of Singapore, Anna Su, Assistant Professor of Law at University of Toronto spoke of law and religion. Publication: John M. Collins, Martial Law and English Law, c. 1500 - c.1700 (New York: Cambridge University Press, 2016). John M. Collins, Lecturer in History at Eastern Washington University, has recently published a book on the origins of martial law in England, a subject that interests many H-Law subscribers. You may contact him at jcollins2@ewu.edu. He provides a description of his book below. Read more about Publication: John M. Collins, Martial Law and English Law, c. 1500 - c.1700 (New York: Cambridge University Press, 2016). Jedidiah J. Kroncke’s book The Futility of Law and Development: China and the Dangers of Exporting American Law (New York: Oxford University Press, 2016) would be of interest to readers of this blog. Kroncke, currently Professor of Law at Fundação Getulio Vargas Law School at São Paulo, examines the historical role of US-China relations in the formation of modern American legal internationalism and the decline of American legal comparativism. A Sixteenth-Century Fatwa Collection: Islamic Law in “Periphery"
Our blog post today highlights a discrete volume of fatwas (legal opinions) from the sixteenth century compiled in South Asia. Our blogger is Mahmood Kooria, a doctoral candidate at the Leiden University Institute for History. His dissertation focuses on the circulation of Islamic legal ideas and texts across the Indian Ocean and Eastern Mediterranean worlds. He read his M.A. and M.Phil. Read more about A Sixteenth-Century Fatwa Collection: Islamic Law in “Periphery"
This blog post looks at a nineteenth-century primary source in Chinese from Batavia (present-day Jakarta) in the Netherlands Indies. 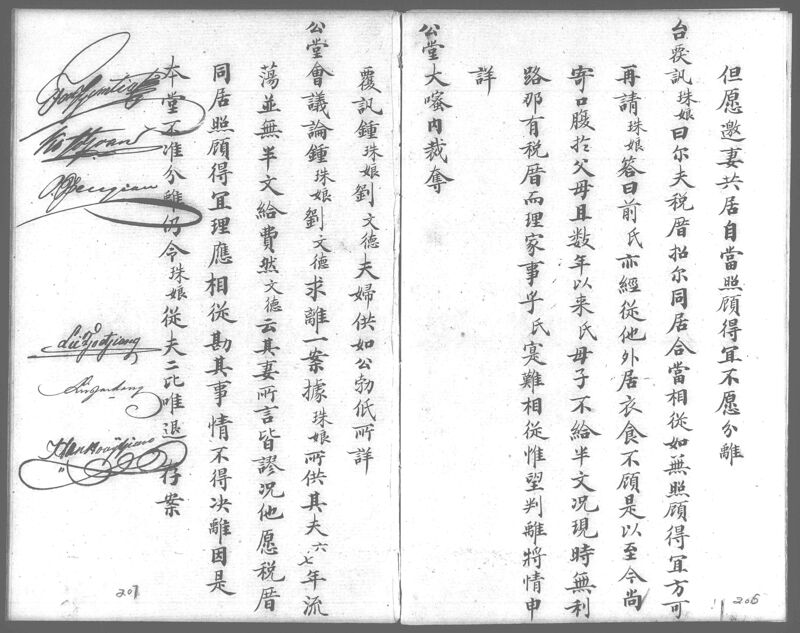 The legal document which can be seen here recorded the pleas and ruling by the Chinese Council of Batavia in 1874. In the 1870s, the Chinese population in Batavia comprised slightly more than 20% of population of the Dutch colonial capital city. In line with our previous blog post, we keep our focus on judges as we examine their sometimes fraught relationship with goverment authorities in the colonies during the nineteenth century. Ideas emanating from the imperial center took root in various depths and forms in the colonies. Our blogger today, Jack Jin Gary Lee, explores the impact of English philosopher and political economist (amongst other things) John Stuart Mill’s ideas on colonial judges in the British Empire. Our blogger is Zubair Abbasi who is an Assistant Professor at Lahore University of Management Sciences. Zubair Abbasi completed his doctorate from the Faculty of Law, Oxford University. The focus of his doctoral thesis was on the transplantation of English legal system in colonial India and the interaction between Islamic law (Fiqh) and English law in this process. This is the first post on the World Legal History Blog that focuses on a historical source. From next week onwards, we will have other legal historians contributing posts on their own sources on any theme, time and place, between 500 and 800 words ideally. If you are interested in blogging on a historical source drawn from your own research, or to launch a discussion on a topic (or two) relevant to the study of World Legal History in general, email me at wlhblawg@gmail.com. Over the coming weeks, we will hopefully explore the challenges of researching and writing about historical cases of family law involving living descendants. Welcome to the first post on World Legal History Blog hosted by H-Law!